The 2N RFID Card Reader Module features a 125kHz RFID Card Reader for use with Proximity Cards and Fobs for non-contact, code-free access. 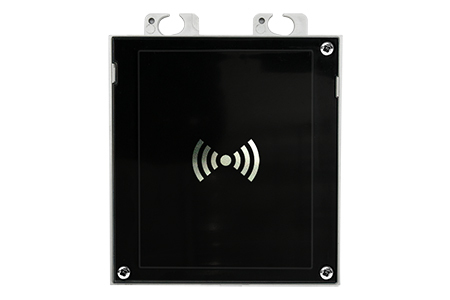 Using the 125kHz frequency, this RFID Card Reader supports EM-41xx or HID proximity cards including the 2N verso base models. The Verso 9155032 RFID Card Reader Module can be used either within the same Frame as the base units, individually in its own frame, or with other Additonal Function Modules in a multiple-Module Frame. If you would like to be notified when the"2N IP Verso RFID Card Reader 125KHz (9155032)" is re-stocked, please enter your contact details and we will notify you instantly.